People born under the Leo Earth Dragon sign are generous. They are not hesitant to give more than others. They have a strong sense of loyalty so don’t worry about them stabbing you in the back, in fact, they will probably save you from one. The LED signs are conservative so they have traditional values and beliefs. They are stable which many people can depend on them. 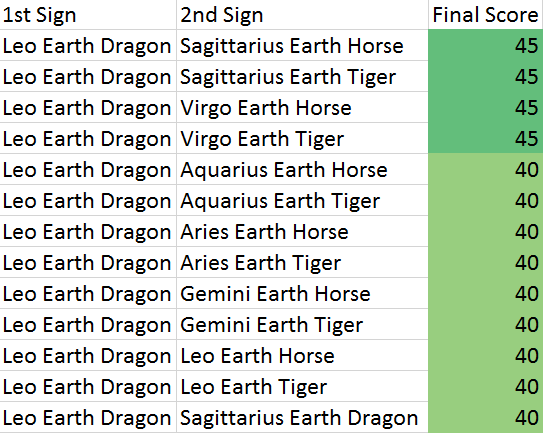 Leo Earth Dragons are one of the most ambitious signs. They will do whatever it takes to achieve their goals. They are one of the most energetic signs so get ready for a ride. On the other hand, the Leo sign has a tendency to dominate people. They may ignore other people’s feelings and force their way to obtain what they desire. Their arrogance will make them think highly of themselves which can sometimes hurt others around them. The LEDs can be very selfish and will not care for other people’s interest. They are also stubborn so don’t try too hard to convince them that they are wrong because it may take some time. Leo Earth Dragons are demanding of others, making it very difficult for people to get along with them. They can become eccentric and become irregular and go against conventions.